A series of FAQs for a fake MMO. A bot for #PROCJAM that reports on news in your local fantasy setting every hour. ​A chiptrance soundtrack for a currently fake game. A LDJam game about mental health. A demo for a 99 character RPG. Control 99 characters against a 999999 HP boss. Navigate labyrinths and evade monsters! While I enjoy going to events Like GDC to meet other developers and talk about projects, I can't make it this year since I now live in Illinois, rather than a simple 2 hour bus ride away from SF. But I've also got an important project I've been working on that's available for Early Access right now and will be fully released later this year. It also has a free demo of the first world of the game. 'I Have Low Stats But My Class Is "Leader", So I Recruited Everyone I Know To Fight The Dark Lord' is a comedy RPG where you play as 99 characters at once. While it largely parodies the sort of things you find in traditional RPGs, a lot of the focus is how the cast of characters interact with one another and how that reflects in some of the game mechanics. I was recently on a podcast where I talked about some of the design and writing decisions. I also made a talk for #notGDC about how to survive as an indie dev if that's something of interest. As a heads up, both the podcast and talk are fairly long, but there's not much to watch on either so you can just listen to them. If you're interested in weirder projects that aren't technically games, I have some projects such as a WIP tabletop/email system where you don't roll to do things; you submit forms and paperwork. If you want to rent equipment from the guild to use on a quest, you need to file a Guild Rental Agreement. Something happens on the quest? GM (Guild Master) gives you an Incident Report you need to deal with. Get injured? File an Insurance Claim. I also make things for games that don't exist, such as this soundtrack for a fake retro cyberpunk game and this series of FAQs for a non-existent MMORPG. Thank you for reading and checking this stuff out, and hope everyone has a good week, regardless of proximity to GDC! I've been meaning to make a proper Instruction Booklet for the game. I'll keep this in mind. I'm not opposed, but I have to ask something. Thank you! The scary part is how much more I wanted to add. I'll probably just add more to this entry in future years. I honestly haven't played many MMORPGs. The one I have pretty much any experience with was Wakfu, where the ecosystem concept was really interesting, but also oddly executed initially since there was literally no currency that players didn't mint, so everyone just mined all the time to make coinage, which they eventually altered. But yeah, I really just wanted to come at this with the thought of 'if I had virtually no resource restrictions, what would I want to try and make'. I may have to add that in future games then! Playing around with the race creation made me want to get back into trying to make a tabletop game again. Great art, but wow I never knew how much I needed a game that combined jetpacks, archery, and yo-yos. Personally, I'm holding out for the Kendama DLC. Definitely a lot of interesting ideas here. Curious to see what you do with them! A fairly fitting script for the game, but I really am drawn in by that picture. Dig the look! Also, not a bad design doc; some neat ideas for cheats. Really dig the minimalistic look! Solid sprite art; also really appreciate that promo manual. Solid stuff, especially the last song (as I am perpetually weak to battle music). Also, very nice description file. Really dig the concept; I especially appreciate the release notes! Also, that song is catchy as hell. Strikes me as the game we would've had if Suda51 had the team for Jet Set Radio. Really nice work! Right, there's no easy way to categorize that. I'd think Prototype, since it's concepts and nothing more. Can I make any of these game concepts into a game? If it's your own, do whatever; just don't include the game in your submission. If it's not your own, that's up to whoever submitted it so message them. Everyone retains the rights to whatever they submit. Sure, I'm not the boss of you. If you have any other questions, please ask them below. 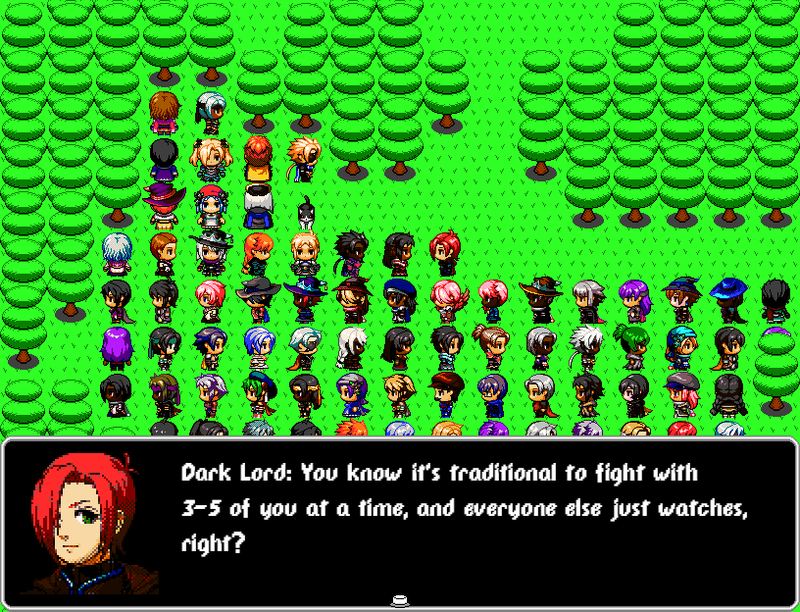 'I Have Low Stats But My Class Is "Leader", So I Recruited Everyone I Know To Fight The Dark Lord' is a PC/Mac game about adventure, working with others, and basically trying to control 99 characters at once. You can play the current demo here. The game is more of a comedy/puzzle game than anything else. I'm currently reworking the combat system to let you select characters freely to take actions, and then the boss takes an action after you do a few times (based on how the skills you use generate aggro). The current demo takes roughly 40 minutes to get through; much of the start involves you talking to people in town and recruiting literally everyone you meet: from actual hunters and mercenaries, to your friends, to your parents, to the neighborhood cat. I've also got a Kickstarter going for it right now, in case you want to support the game's development. itch.io Community » General » General Discussion · Replied to Keero Kamiya in Introduce yourself! You could go for that route, or have it be for story-related reasons. You could remove experience entirely, but there's typically a sense of progression you want the player to have. Could have it where after certain points/events characters gain new skills, opening up more options during combat. Likewise with equipment and items. Rpgs are a lot of work if you're trying to make tons of characters, and enemies, and write a story, and sidequests... I'm working on a 99 character rpg currently, so I often let my ideas get too... ambitious. I'd recommend really trying to limit your game scope to 1 party of 3-5 characters and a pretty simple dungeon or map if you want to try making one. I believe anyone can make an rpg, it's just a matter of keeping your scope small on your first ones to prevent burnout. You'll learn a lot from it though, like how to stick to one overall mechanic for combat and how to balance groups of characters/monsters both against and with each other. Talk to everybody else in the town; the last person's always holding it. Don't forget the cat, or characters like the Princess who will let you recurit previously un-recruitable characters. There should be no NPCs left by the time you're done. Thank you! 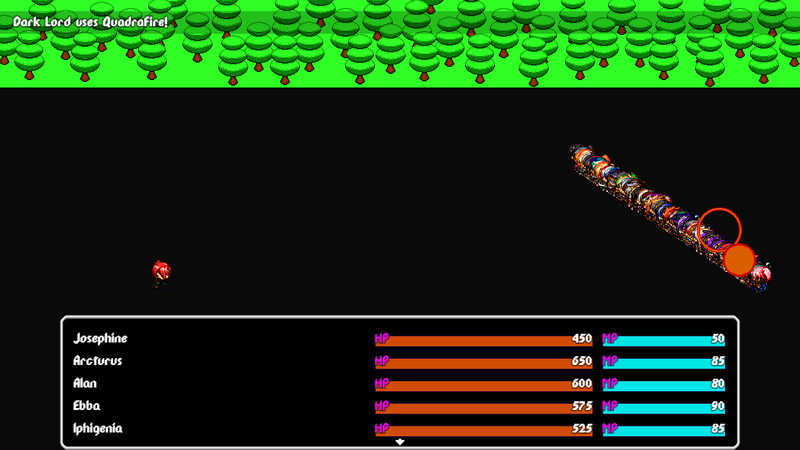 It was fun to experiment with a new game engine and see if this was interesting to people. I'll likely come back to this and mess around some more in the future; at least to add more levels and make them slightly easier. MS Paint Jam 2k17 community · Posted in Hello! Hello! 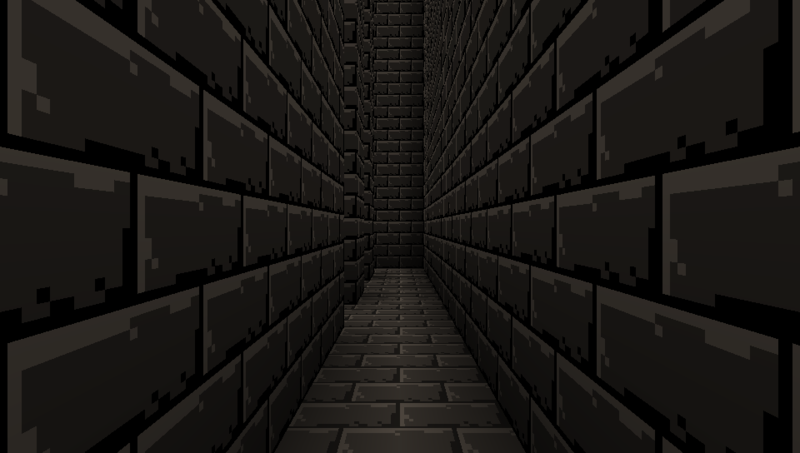 My name is Damien, and I'm going to make a labyrinth simulator for the jam. I usually only use MSPaint for my game art anyway, and I've been needing an excuse to practice my pixel art more. Hello there! I appreciate the lengthy feedback! This game was originally because of a couple joke ideas from friends about what a game could have (like an annoyingly large party of characters to control, and a really strange stat system), but as I started putting them together I found it interesting enough to keep working with the idea. That's also the reason for the similarity with the name Mighty No. 9; this was originally just a joke game but I got attached to it. I do want to have there be emotional attachment and character development, so I was thinking of having a large dungeon where you start with one character and gain a new one on each floor after completing a sidequest or something pertaining to them. Interacting with each character this way would help to build the player's relationship with each character that you come across, I think. The current roadblock I'm having is giving a motive for the starting character to be progressing through the dungeon in the first place, as well as why the other characters decide to join you rather than compete for whatever's at the end. Having sacrifice be the centerpiece isn't a bad idea, and it may be fitting for how things go at the end of the game, but I want to focus on the accumulation and building up of the party and intercharacter relationships that are fostered. There will certainly be dramatic moments (especially considering certain character backstories and encounters I want to include), but I don't want to force many uncomfortable choices. I'd rather keep the characters and have more encounters and interactions that make the player appreciate them. Keeping the players interest on such a large cast is an interesting challenge that I'm hoping to somehow maintain throughout the game. The reason it lags (outside of the start when it has to deal with loading that many characters onto the screen) is because I originally had every battle animation play on each affected character, and I found the result when I tested it funny enough to just leave that way. It's a simple fix that will be corrected in future releases. 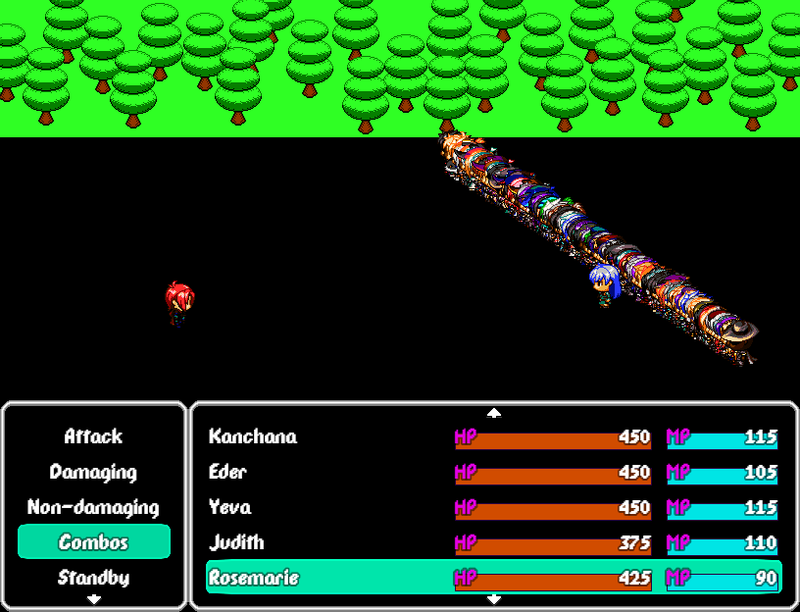 Elsewise, the combat is fairly repetitive and taxing in its current state. I'm currently thinking of having each character have a few skills, but rather than going through each one in the current turn-based fashion, you pick one character to use a skill (or maybe just pick which character should act), and the enemy responds to it. It's sort of like a pacifist run of Undertale in that way, where you pick actions and try to get through the situation, except each character is set in what they can do each time, but there's a lot of options when looking across the whole cast. It'd be a way of representing conflict that allows for encounters with things that aren't monstrous in nature. I'm rather open to looking at other concepts for the gameplay system though. I'll have a look at the Player vs. Protagonist relationship; thanks for recommending it! Thank you again for your feedback, and I hope you enjoy what this game becomes! That's part and parcel with the game, so I understand that it's not for you. I recommend trying the "Skills" command for each character. It is exhausting to go through; having played this several times while making it, I understand that, but that's the way it is. I like the concept, but as it is right now, the days pass by too quickly for me to make any headway. Since the amount of debt keeps piling up each day, each upgrade or park addition hurts. I can get a couple businesses and upgrades, but I can't make it past day 10. Also, is there ever a need for more than one reservoir in a district? Water never seemed to decrease. Seeing there be an actual category for physical games when I was browsing on here got me started on working on a tabletop RPG idea. I'm hoping to have a solid beta rulebook by the end of the month. I have 10 races (most of them original; Humans exist, but rather than being the 'average' race, they have the highest Toughness and heal faster than others) and 21 classes (which is why this has been a pain to balance). Rather than there being actions per turn (like D&D and Shadowrun with Free Actions and Complex Actions and whatnot), a character has Action Points they can use each turn (to better reflect the amount of time/effort certain actions take). Although this sounds somewhat complicated, it's also a d2 system and I'm working on equipment and how to keep that fairly simple as well. The spell system is killing me right now, but I may end up making it something similar to Shadowrun's method to keep my designs from spiraling too far out of control. I'll probably post here once I have it all in a properly sorted PDF. I'm always down to talk about writing and design, btw. The size of the site does matter right now, since Steam is pretty dominant on the market and there isn't much reason for people to look elsewhere unless they're really interested in the indie game scene themselves. I will say that a large issue is marketing as well. Most indie developers hope that getting on a front page or having a banner ad someplace will do wonders, and while it may help, there's a lot more that you can do. Look at the Big List of Youtubers, see who would be interested in your game, watch a video or two of theirs to be sure, and send them an email. It's exhausting (at least for me; I still need to finish going through the list), but contacting people for reviews helps out. Twitter helps too; if you're an indie developer and not on there, seriously consider getting an account just because it's so simple to just throw hashtags onto posts with screenshots and store pages to boost your reach. I managed to get a couple very small channels to do a review on Youtube because I asked publicly on Twitter (and they were even pretty positive, like this one!). Even if the reviewer has no subscribers, don't underestimate the value of someone being able to type in the name of your game and be able to see someone else play and examine it. Also, pitch your game at the drop of a hat. If a stranger comments on your shirt because they recognize and like the band on it, mention how you like whatever style of music it is, but that you haven't had much time to listen to them since you've been working on your game. Learn how to segway discussions with potential players toward your game and what makes it so interesting. Always have pen and paper on hand to give your game's url to people. It may seem insignificant, but I've made more than one sale and several downloads this way. I'm sure there's a couple more factors as to why it's hard to find success on here, but I think the site size (and relative obscurity in comparison to places like Steam and GOG) and the average indie dev's marketing strategy to be the main issues. Right now I'm working on a tabletop system (still trying to come up with a good name for it; naming things is always tough for me) that has 10 different races and 21 classes, and a wide variety of skills and abilities. Since there's a lot of unique races and ccharacter types, I'm making it with a d2 system to help keep things somewhat simple. All you need is the rulebook and some spare coins. I actually had the idea on the backburner for a little while, but when I noticed we can actually put physical games on here, I decided to really start working hard on it. While I have a lot of the work done, I still need to finish formatting it to be more legible for people. One of the biggest challenges of this as opposed to video game design is the fact that I really have to explain formulas and every single detail so players don't get lost, but getting to work so heavily on design has been nice. Hello! My name is Damien, and I make RPG's. I currently only have one out, Legend of Moros, that has about 30 hours of gameplay. It took 2 1/2 years to make, mostly because I had to learn how to do pixel art, game design and balance, and do a lot of re-writes for the story. I know pretty minimal coding; I'm currently working on a tabletop system since I enjoy working on game design and worldbuilding most of all. I spend most of my time either working on games or reading about them.